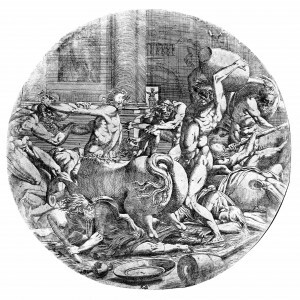 Etching by Antonio Fantuzzi, 30 diameter (Zerner). Herbet, II, 1896, 280 (1969, 76), 36, as Fantuzzi after Rosso’s fresco in the Gallery of Francis I. Zerner, 1969, A.F.31, as 1543-1544 and perhaps after a first design by Rosso for his fresco. COLLECTIONS: Paris, Ed 14d. Paris, Bibliothèque de l’Arsenal, Vol. 168(2), no. 59 (see Schéfer below). Paris, Ensba, inscribed in ink at the bottom: Rosso. Schéfer, 1894-1929, col. 554, no. 59, as after Rosso’s fresco. Kusenberg, 1931, 165, as after Rosso’s fresco, according to Herbet. Béguin, RdA, 1969, 105, as not sure of Rosso as the inventor and suggested Primaticcio. K. Wilson-Chevalier, in Fontainebleau, 1985, 197-198, 199 (Paris), as Fantuzzi and almost certainly after Luca Penni. Béguin, 1989, 831, and Fig. 23 (Paris), as possibly after Rosso and for one of the small tondi on the East Wall of the Gallery of Francis I. 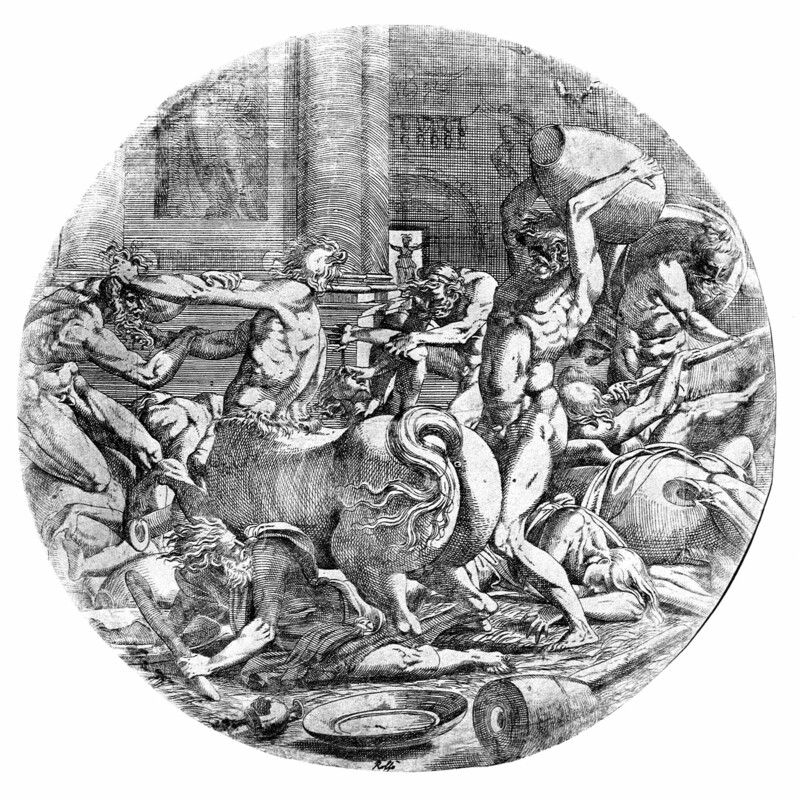 Although of the same subject as Rosso’s fresco in the Gallery of Francis I at Fontainebleau, stylistically the etched scene bears no resemblance to Rosso’s art. It would also be very strange that two scenes of this subject would be in the gallery, as suggested by Béguin. Béguin’s first suggestion of Primaticcio seems closer to the point. But the rythmic swiftness of the composition and the figure types do not wholly seem to be his, especially before 1543-1544, the date assigned to the print by Zerner. In any case, if by Fantuzzi it would have been done before around 1545. It is possible that the etching is not by this etcher and that the design is of a later period. Wilson-Chevalier suggested that the composition is by Luca Penni.